South Sudan oil-output forecasts: Wood Mackenzie Ltd.
Crude production fell by about two-thirds to 130,000 barrels per day as blocks were shut-in during a conflict that erupted in late 2013, after a dispute between President Salva Kiir and his former deputy, Riek Machar. The two sides agreed in August to end fighting that claimed tens of thousands of lives. The full extent of damage to field infrastructure as a result of the conflict is unknown, as well as the performance of reservoirs that were closed, she said. China National Petroleum Corp., Oil & Natural Gas Corp. of India and Petronas Bhd of Malaysia are the main operators of South Sudan’s oil blocks. Two of South Sudan’s production areas yield Nile Blend, a light, sweet crude that could meet demand from Indian and European refiners as Iranian volumes decline. The government, which said last year it wants to restore output to 350,000 barrels per day, began restoring production in August. 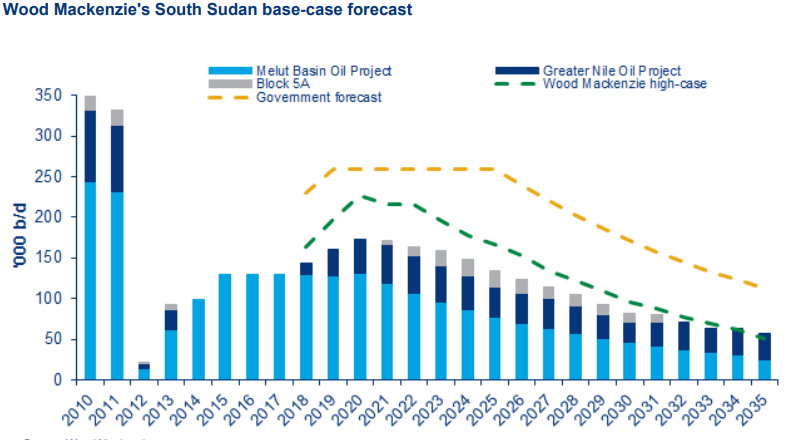 WoodMac expects South Sudan production to increase to more than 170,000 barrels per day by 2020. Production could reach 230,000 barrels a day in the same period if a lasting peace is sustained, generating more than $3 billion of revenue for the government, it said.